It's all happening over here at Hollywood, we stock thousands of costumes and accessories whose themes span all eras and continents. 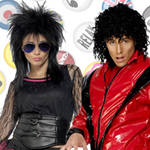 With hundreds of film and television character costumes and classic fancy dress outfits that can be used again and again! Whatever your style, we can help. Whatever your budget, we can help. Whatever the theme, we can help. Getting you dressed for the event, you're on your own! Nevertheless as our range (like our suspicion with garden gnomes) grows a little bit more everyday so does our huge movie quality Hire section in store. Whoever you're looking to become, whether you're a Knight whose doesn't like confrontation, a Mario Brother who can actually fix a boiler, or a Willy Wonka who just isn't the chocolate type (yes they do exist) with a twitch of our noses Hollywood can help make your wishes come true! Our fancy dress collection is so fun we wish it was called 'funcy dress' and as soon as the people at Oxford Dictionary see our selection, we have a feeling it just might!